Sarasota, FL. : Local workforce development non-profit, CareerEdge Funders Collaborative, has created a career guide to assist students in the region with choosing a pathway to a career. 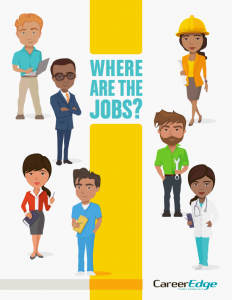 The Where are the Jobs? guide features high-demand jobs, the average wages and the educational pathways needed to obtain each occupation. The goal of the guide is to provide students, parents, mentors and guidance counselors with information regarding well-paying/high-quality careers. With educational pathways ranging from technical certificates to advanced degrees, students can choose their own path to a good career. The Where are the Jobs? guide was developed with input from youth organizations, who wanted support with helping students to explore career options and to set goals. It is also being shared with school guidance counselors and career advisors. “Many industries featured in the guide are not able to find enough skilled labor to fill positions. CareerEdge hopes that the guide will help provide a pipeline of skilled workers, and will lead young adults in our region to secure family-sustaining wages,” says Executive Director of CareerEdge, Mireya Eavey.